My my the days go by, and we all chase the light. 90 years is a long time by any measure. Tis a statistical outlier who lives so long, with wit and sanity (mostly – aside for grudges and prejudices) intact no less. As it goes, my final grandparent – my maternal grandmother, Isobel Steele Bannatyne – passed away on Saturday. She was in Indiana and will be buried in Logan, Utah (or nearby anyhow) where many of my kin live. Shall i travel down? My first thought is “of course” but then i realized, i am weak, weary and while full of love, i am low on tolerance for emotional expression. I am raw from the past year(s) and am scared to take steps back by pushing myself. I talked to doctors who advised me to put myself first. I don’t come naturally to this. I am strong in the clutch and reliable in challenging circumstances. I was there twice last year after swearing to never go again after a visit before Grandpa died. I gave away by VW bus, my bicycles, my art so i wouldn’t need to return. I did. Twice. “I am not needed. I am OK meditating and celebrating in my own way” – this is what i am right now. There is an obituary but it describes someone i don’t know. My kin are religious folk and this colours the narrative of their lives. Eclipses everything else, purposely. These ways are not mine. Death can provide context for healing rifts or death can be the spectre of chaos and mistrust within families. I’ve seen both very recently. To my hundreds of cousins, uncles, aunts, Mom, et al. Hold each other as needed. I suspect it will not be needed. 90 years is a long time. To the rest of you, above Grandma as i remember. 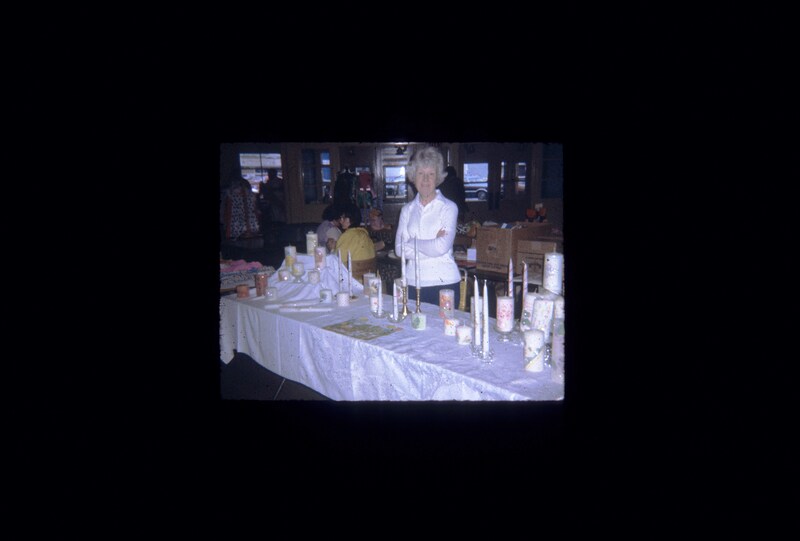 Sometimes in the 1970s, at a craft show selling my Mom’s candles at some craft fair. I was the frequent sidekick and candle maker and these times make me happy. Before i knew of tension caused by beliefs, intolerance – there is no judgement or blame. It is me. For the record: Here’s the obituary for Isobel Steele Bannatyne as published in Logan (Utah) Herald Journal.